This afternoon, I had an email message and a phone call from my editor at Fortress. The requirements of production and marketing oblige me to propose my alternate title within twenty-four hours (actually, by now it’s down to around twenty-one). Fortress put the project together under the name Faithful Subversion: Reading the Bible in a Postmodern World , which makes me uneasy; the “faithful” part stands to bother readers who might be attracted to “subversive” readings of the Bible, and vice versa. On the whole, I’d rather not invoke either of those words in the title. The top half of the cover features a close-up of the central valley of an open book, over a flipped and reversed-out negative copy of the same image (on the lower half). Laura points out that this design “is looking for a two-word phrase that contains a paradox or other kind of surprising juxtaposition,” and I think she’s quite right. I tried Walk This Way on my editor, and he felt (and I agree) that it just doesn’t look quite right. So the minutes are ticking away. Readers who know the kinds of thing I’m probably writing about, please rack your brains to help me out on this. I’m inclined to ask that the subtitle be changed to “Reasoning Biblically in a Postmodern World,” but apart from a title, the subtitle doesn’t matter much. A combination of “Interpreting” or “Meaning” or “Signifying” with something else would be especially welcome. I’ve had a project in mind for a long time which I’d expected to call “Representing the Truth”; maybe that title would work here. If I used my envisagted-future title for this book, it would make the second time I’ve had to draw on a title from a prospective work to identify an actual work; the publishers of my first book chose Making Sense of New Testament Theology as the title, when I had been hoping to save that for a later, different book. If you can offer any help at this stage, please speak up (even if I don’t take your suggestion, it may jar loose the title I’m looking for from the logjam in my brain). In the past few days, a number of Firewire devices around the Adam family compound have refused to mount (on two different CPUs). Different cables, different peripherals, different computers, no discernible static discharges, but inconsistent mounting behavior. Since I can’t figure out what’s going on, it’s driving me batty. No, I’m not still brooding about sending my wife and son away again (or, more to the point, I am still brooding about sending Margaret away, but I wasn’t thinking about it until you reminded me just now, thank you very much). Instead, I’m wincing about having to leave my iBook in the tender care of the local Apple Store. I could have kept running it from the power adapter indefinitely, but I knew I’d have to bring it in sometime. Since this is the Holiday Overconsumption Season, the interval between now and mid-January (perhaps even longer, if Steve makes an exciting announcement such as “Intel iBooks available!”) will see a steady pack of would-be buyers and desperate service-seekers jamming Apple retail outlets; I figured that today was my best bet to get careful, patient attention from an Apple employee. They confirmed what you and I already suspected: that either the DC connector or the power controller has gone bad. If it’s only the DC connector, we’re out of there relatively inexpensively. If it’s the power controller, well, it could be worse: It could be the power controller and the screen, one hinge, and the optical drive. In the meantime, my ol’ trusty TiBook has stepped off the bench and is filling in for its younger, more robust compatriot. It doesn’t recognize my hard drive at work, though it does recognize my home back-up drive. Its own optical drive seems moody or dysfunctional. It has a slower processor and half as much RAM, and I haven’t upgraded its OS or added the Pages application in which I did most of my word processing for the past year. And I’m not even going to try to install World of Warcraft on this unit; sorry, Joi, but I’ll join in as soon as I can. But I’ll tell you — those three extra inches of screen size sure look great. The Microsofties who showed that the biggest productivity boost you can give your system is more screen area were definitely onto something. I’m looking at 15″ PowerBooks with lust in my heart. I hesitate to intrude — but a vexatious conflict has opened up in an area of Blogaria that’s dear to my interests, and it’s worth deliberating about, in several different dimensions. The conflict concerns Flickr, “almost certainly the best online photo management and sharing application in the world.” It turns out that at some point, Flickr has begun segregating certain images that do not appear to be photographic, on the basis that their brand identity involves their “photo sharing” function. Drawings, paintings, computer-generated fractal patterns, and doodles do not count as “photos,” on this account, so the 700 Hoboes Project (for one prominent instance) ought not appear in publicly-accessible areas of Flickr. When Flickr has private-ized drawings, their artists and sympathizers have made a ruckus. To grant Flickr all the sound points possible, it’s clear that they present the site as a photo sharing application, and they do differentiate photos from drawings or other graphic designs. It would be unreasonable to use Flickr as insulation from the bandwidth costs that elaborate graphics can run up. They have made that explicit, although not necessarily obvious. And it’s their (Yahoo’s) site and service, so if they want to enforce their terms of service over against the practice of their clients, then it’s their prerogative. On the hand, this situations entails certain peculiarities that actually correspond to problems with the RIAA/mp3 controversies. In both cases, commercial agencies try to constrain their clients’ online behavior based on aspects of physical-world media. As a point of fact, there’s no intrinsic difference between jpg files generated by digital cameras and those generated by scanners (EXIL data notwithstanding) — and it’s easy enough to take a digital photo of a drawing, and to scan a photographic print. Which is the true Flickr-OK “photograph”? Moreover (as constant readers of Jeff Ward or even my talk about visual hermeneutics from two years ago will immediately recall) all these distinctions along the spectrum that runs between “photograph” and “printed text” run the risk of invidious arbitrariness. Is a photograph of printed text more Flickr-OK than a scan of printed text? On what basis? Is a photograph of a drawing more Flickr-OK than a scan of the same drawing? Will it make a difference if a photo has been altered to look more painterly (as with a filter in Photoshop or Painter)? What is it about the bits that have been gathered together to represent visual information in a “photograph” that differentiates them from bits gathered for visual information in a “scanned drawing” or even a digital sketch? Furthermore, although Flickr has maintained its concentration upon photo sharing, the viral aspects of Flickr have all along been the way they engineered in collaboration and social interaction. Flickr is, after all, the mainstream genius offspring of the eccentric genius of the late lamented Game Neverending (Wikipedia). In both, the most obvious features (photo sharing, multi-player gaming) thrive because they’re wrapped around robust, innovative social software. Under the circumstances, the features that have made Flickr unique and popular have nothing to do with the mechanical means by which bits were defined as representations of an image, and everything to do with the interactions between participants (which again have nothing to do with whether the images involve “photographs” or “drawings” or whatever). Flickr made itself precious to its clients by devising a way for them to do something they loved. At this point, restricting the bits they can share to “photographic” bits risks cutting down the tree’s trunk in order to sustain its leaves. All in all, a difficult case, and an odd circumstance in which to read about the Flickr-ization of Yahoo, when one might suspect that current events foreshadow the corporatization of Flickr, instead. We’ve done four or five loads of dishes, rearranged the furniture back to a condition approximating the pre-party alignment, and dropped my beloved bride off at the airport for her return to her homework and paper-grading. Happily, she’ll be back in less than three weeks. I took Bruce’s advice this morning relative to my power management problem; I downloaded Coconut Battery tester for OS X 10.4 (Tiger), and it confirmed what System Profiler told me: the battery ain’t charging. I swapped in Si’s battery, and his didn’t charge either (we didn’t try my battery in his iBook). I was hopeful, since my battery shows 411 cycles — I thought my battery might be dying. Alas, that seems not to be the case. Margaret was worried about the impression her lime rice might have given last night; it turns out that the garlic she pressed during her preparations turned a greenish blue when she used iot to season the rice. At the time, I figured it was just lime rind in the rice (which tasted fine); as it turns out, it was indeed the (startling, but quite harmless and delicious) garlic. That which I couldn’t say earlier in the day is that tonight our family held its first-ever surprise party, to celebrate Pippa’s birthday (five days early, as Margaret has to leave tomorrow morning). A large passel of Pippa’s friends from seminary life gathered to surprise her, share our enchiladas (she didn’t guess, even from the superhuman quantity of enchiladas she and Margaret baked this afternoon), and play Bible Pictionary. A splendid time was had by all. I couldn’t feel more pride and exhilaration at Pippa’s closeness to so many wonderful adult friends. She’s a gift. Did I say that Margaret leaves tomorrow? The party gave us something to focus on other than the number of hours till she heads back to Durham; now that’s oppressively present to my awareness. She’s upstairs, quietly packing, now; I’m downstairs, pretending I don’t know what she’s up to. Thank heavens she’ll be back in a couple of weeks. For what am I thankful? So many answers; I hope no reader will be miffed if I state, first and most emphatically, that I thank God daily for the marvelous family that surrounds me. The odds disfavor anyone winding up with this provocatively splendid bunch, and I’m first in line to emphasize that I wasn’t a propitious candidate for “father of a marvelous nuclear family.” We’ve pulled together through a number of challenges despite my many weaknesses — we’ve shared our family life with a number of dear friends; we keep growing, closer and stronger. Through their affection and support, I can also give thanks for everyone around who offers generous encouragement and necessary criticism. I give thanks for the plenty that makes it possible for me to worry about finances in a general way, rather than the specific “getting by day to day” way, or the “can’t even worry about finances” way of miserable scarcity. I have a job that brings me into the lives of people, some of whom give up practically all their old lives, who turn to me for instruction, for guidance in perplexity, for spiritual support. And I have an avocation that entangles my prose and promises and prayers with the lived questions and affirmations of friends around the world. I thank God, and I thank you. Thank you. 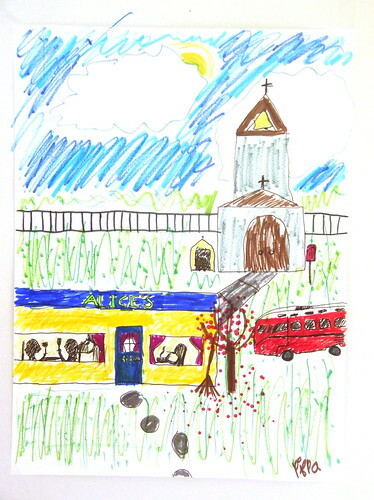 PIppa has been so caught up in the excitement that she drew a poster of Alice’s Restaurant, complete with red VW microbus and a restaurant separate from the church (since, after all, Alice didn’t live in the restaurant, but in the church nearby the restaurant) and a doghouse for Sasha the dog. It would be great if Nate and Jennifer and Juliet could be here — and grandparents, and aunts — but Si and Laura will gather round the fire with Margaret and Pip and me, and we’ll eat till we can’t hold another tortilla. Oh, and one more thing — but I can’t tell you that yet. It’s not that I didn’t have time to blog today. I did, this morning; but once the day started rolling, it was activities back to back. Late morning, I needed to drive the college boy to Laura’s house where he would celebrate Thanksgiving with them, today (Laura’s coming over to our house to celebrate with us tomorrow). When I got back from dropping him off, we walked down to the movie theater to catch Harry Potter on a less-crowded day (we thought). As it turns out, even with four or five screens showing Harry Potter , the theater was pretty crowded. Once we got back from the movie, Pippa and I needed to go to the grocer to buy provisions for tomorrow’s banquet. That took a long-ish while. Then dinner. Then we watched King Kong , the original version. That’s the day, friends. Capsule movie reviews? Goblet of Fire , excellent, though so much was cut from the book that non-book-readers must be bewildered by some developments (Pip and I took a long time explaining various elements to Margaret). I’ll have more to say about Harry Potter and Christian theology sometime. * Charlie and the Chocolate Factory (last night), excellent — though was Roald Dahl’s original quite so transparent to pop psychology and Michael Jackson? Johnny Depp, however, is an amazing actor, and I loved Helena Bonham Carter and Noah Taylor. King Kong 1933: Stagy and sometimes jerky, the power of the original vision shines through the hokiness. Hasn’t anyone learned not to shoot flash photographs at monsters, though? I thought that was Lesson One (or “Two,” after “Don’t twist your ankle.”). * Yes, I know I’ve already promised to write more about romantic theology. Someday, I will fulfill each promise. I’m determined to do absolutely nothing productive today. I’m sitting in the dining room, blogging on my battery-impaired iBook, sipping coffee from my Baker Academic travel mug, wearing my Fortress Press 2005 World Tour t-shirt, and re-gathering my energies after an intense four-day Society of Biblical Literature meeting. Incidentally, the conference totaled 10,002 registrants at last count, of which nearly half were members of the Society of Biblical Literature, the slightly larger half being members of the American Academy of Religion. The two societies will no longer meet in conjunction as of 2007, but for now we can expect five-digit attendance totals. After the Great Divorce, Margaret and I will have to decide which meetings who will attend, since she’s in systematic theology and I’m in biblical studies — though a number of Christian-theologically-identified scholars will likely be meeting in cooperation with the SBL. I’ve been enlisted to join a parallel body, and that probably won’t be the only one. Anyway, it’s time to begin reworking the paper I read at Monday morning’s session of the “Christian Theology and the Bible” section. I’ll post its current state below; over the next few weeks, I’ll flesh out the bit about Johannine theology (left inchoate to keep the paper within time limits) and liturgy as signifying practice (left undeveloped because I didn’t have time to write out carefully what I wanted to say on the subject). When the paper is fully revised, I’ll submit it to journals for publication. But wherever it ends up in periodical print, it will inevitably end up in print somewhere else, since one reason I’m wearing a Fortress Press t-shirt is that about this time last week, I received a contract from Fortress. They’re going to publish a collection of my essays, edited for continuity, sometimes next year. We’re haggling over the title. Fortress suggested “Faithful Subversion,” a phrase they say I used in one of the constituent essays; I prefer “Walk This Way,” which I use as the title of another of the essays (cast your vote below). Start saving your nickels now, and next year buy a couple of copies of a vital contribution to the debates over theology and biblical interpretation. . . .
I’ll try to get back to clean up the links and note styles later in the day; for now, I’m off to run errands with Pippa. Home safely, exhausted. Unnerving cab ride in from O’Hare. Battery-charging still unresponsive; I’ll try switching out batteries to make sure the problem is with charging. Fuller stories tomrrow. Yesterday morning’s session (on Bible scholars who blog) went well, I think; a fairly small room but quite full, and Mark chaired the proceedings with his characteristic grace and élan. The papers went smoothly, and set the stage admirably for the subsequent discussion. Rick’s paper touched on some of the mark-up and information-architecture questions that interest me most, though I’m inclined to doubt that this current approach — which involves a fair amount of entering regularized well-formed metadata — will catch on with less information-intent bloggers. 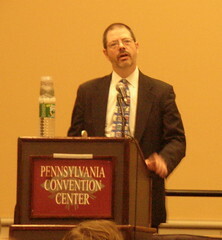 It’s not insignificant that Rick initially designed his personal metadata software to generate imprecise XML; if even he didn’t make the effort to distinguish [cite] from [i] from [em], it’s hard to imagine that less committed bloggers would keep their biblical references consistent, or would fill out the bibliographic metadata for every book they mention. Certainly we have many colleagues who, if they were inclined at all to blog,would give it up in an instant if it involved entering copious tags, keywords, precise identifications of biblical passages, and so on. I think that Flickr and deli.cio.us hit the right trajectory by generating a space for user-oriented metadata, such that if I see something on Rick’s blog that interests me enough to want to retrieve it or categorize it, I can supply the metadata that facilitates such indexing. At the same time, it would be handy if that capacity were integrated to blogging software itself (as it’s integral to Flickr’s photo-sharing software), so that tagging a post were as easy as tagging a Flickr photo. Peter (I think?) raised the very pertinent question of gender; a panel of seven or eight biblical bloggers included only men. Sadly Helenann couldn’t come, and people such as Dylan (who’s also not here) and Mary (whom I haven’t seen here) blog about the Bible, but with more of a view toward homiletics. (Casual readers: it would be hard to overstate the interdisciplinary condescension with which conventional biblical scholars use the term “homiletical”; it frequently sounds as though the word would mean something such as “written in crayon” or “words of one syllable only.”) To the extent that Dylan and Mary don’t enter and link to the arguments that interest people such as Mark or Jim (to concentrate on the A-list biblical bloggers), it’s understandable that they not show up on their radar; that’s not strictly a gender problem, but a social-definition-of-disciplines problem intertwined with a gender problem (and that entwinement isn’t merely coincidental). At the same time, as I said at the session, I suspect that the greater barrier to women’s participation in Blogarian citizenship has to do with the historic pattern of risks and vulnerabilities that academia tends to impose disproportionately on women (and people of color — the panel was all-white, too, not that that would be as surprising in either the biblical academy or online discourse) (very sadly, and again not innocuously). All of this is not by any means to say, “Buck up, look on the bright side” or “No, no, it’s not a problem, stop being so sensitive”; it is a problem, but I want to concentrate my attention on the points d’appui where this problem (and a variety of related problems) put down their roots — rather than only generating heat for the panel organizer. And I didn’t know about Yasmin’s blogging (indeed, there are increasing numbers of biblical bloggers whom I don’t know, which is destined to be the case, further aggravating the “old bloggers network” effect). Now I must get dressed to prepare for this morning’s paper on theological interpretation of Scripture and (of course) signifying practices (honest, I’ll give it a rest once this series of talks is through). More anon.